The contact and compression stage begins when the projectile contacts the ground surface (i.e., target surface). At this instant the projectile is stopped, penetrating not more than 2 times its diameter, and its kinetic energy is transferred to the target rocks in the form of, e.g., shock waves. Shock waves are generated at the contact point between projectile and target’s surface, and propagate simultaneously, into the target rocks and into the projectile itself. When the shock wave reaches the upper surface of the projectile, it is reflected back into the projectile; this wave is called rarefaction wave or tensional wave (Figure 4). Consequently, the projectile is very quickly decompressed and most of it is melted and/or vaporized. Only in some cases fragments of the projectile were recovered within or around the crater. The passage of the shock wave and of the subsequent rarefaction wave through the target rocks also results in the melting and vaporization of a large volume of target material. The shock pressures, in excess of 100 GPa close to the impact point, attenuate with distance from the point of impact, as shock waves decrease in energy density during propagation in the target rocks. Consequently, a variety of shock effects are produced in rock-forming minerals and the relative spatial distribution of these shock transformations and deformations, formed at different pressures and temperatures in autochthonous rocks (i.e., basement rocks), can be used to estimate maximum shock pressures and, thus, the rate of shock attenuation. Shock pressures between 10 to 50 GPa can be reached at several kilometers depth in the case of large impact structures. At even greater distances from the impact point, the shock waves eventually become seismic waves or elastic waves; Pressures of about 1-2 GPa are reached (e.g., Kieffer and Simonds, 1980), not enough to produce any shock transformations, causing brecciation and faulting of the rocks (French, 1998). The contact and compression stage is extremely brief as it is over in no more than a second (e.g., Melosh, 1989). The crater itself forms during the subsequent stage, the so-called excavation stage (Figure 4). Continue now to read about the excavation and modification stages. Figure 4. 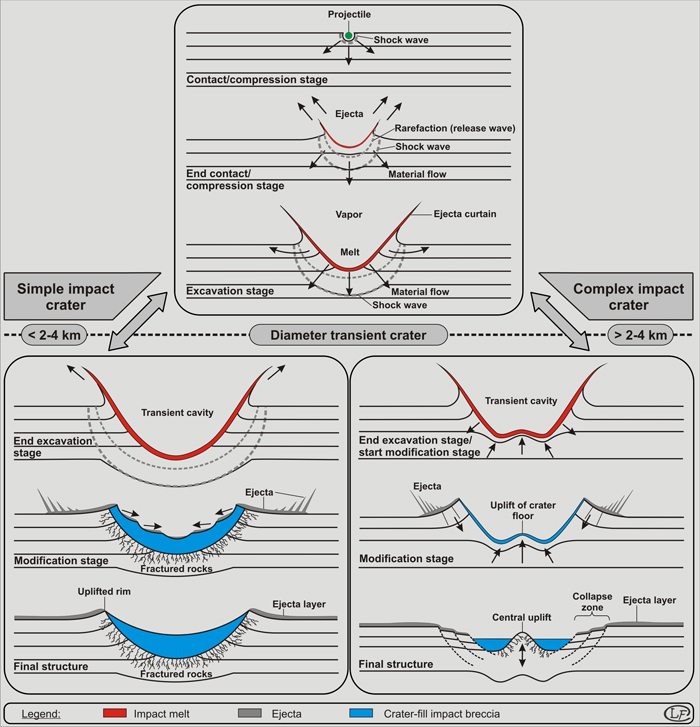 Cross-section diagrams showing the different stages of formation of an impact structure. At small diameters (i.e. diameter <2–4 km), a simple impact crater forms, when for diameters >2–4 km, the initial transient crater is unstable and a complex impact crater forms. The first stage, so–called contact/compression stage, as well as the starting excavation stage is depicted on a unique series of cross-section for both, simple and complex impact craters, as these stages of formation are almost identical in the two cases. See text for discussion on the different stages of formation (modified after French, 1998).